Petrie Athene is a full cow leather polo and all purpose training boot. One of the characteristics of the Petrie Polo boot Athene is the zipper at the front and a lower heel reinforcer. This decreases the pressure on the rider's ankle to ensure maximum comfort. The bootleg is extraordinarily elegant with a snug ankle fit. The Petrie Athene has a full inner calf leather lining.The demanding polo player will find the special comfort foot bed and the slim ankle fit very useful. The Ago glued sole has a non-slip profile and is extremely durable. A good value for money boot. 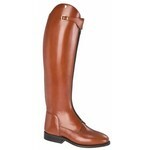 Petrie Athene is a full cow leather polo and all purpose training boot. One of the characteristics of the Petrie Polo boot Athene is the zipper at the front and a lower heel reinforcer.